Forwards Jayna Hefford and Gillian Apps, and defenceman Catherine Ward announced their retirements from the Canadian women's team hockey Thursday, ending careers that saw each player win multiple Olympic gold medals. Jayna Hefford left the Canadian women's hockey team the way she arrived — winning gold in overtime against the United States. After 17 years, four Olympic gold medals and multiple world championships, the 38-year-old forward from Kingston, Ont., was among three players announcing their retirements from Canadian women's team hockey Thursday. Hefford, forward Gillian Apps of Unionville, Ont., and Montreal defenceman Catherine Ward wore the Maple Leaf for the last time in Canada's 3-2 overtime win over the U.S. in the final of the 2014 Winter Olympics in Sochi, Russia. The three women did not play for Canada last season as they stepped away from hockey and pondered their futures. Apps, 31, won three Olympic gold medals during her career and the 28-year-old Ward earned two. Hefford leaves the game with a body of work few women can match. She ranks second behind Canadian teammate Hayley Wickenheiser in all-time games played (267), goals (157) and points (291) for Canada. 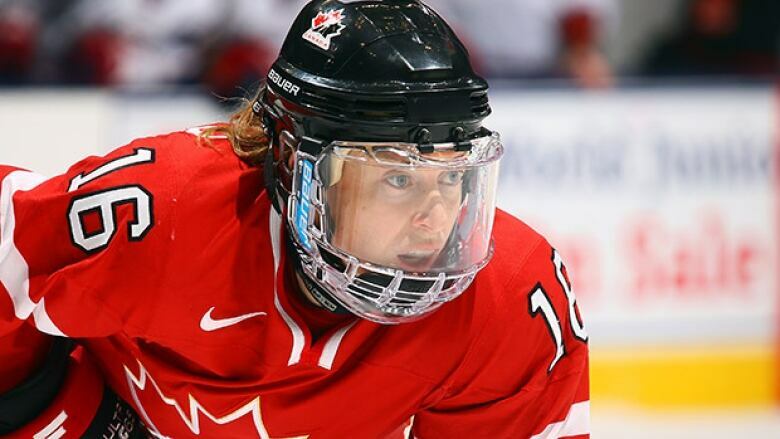 Hefford appeared in 12 of 16 women's world hockey championships and took home gold in seven of them. Not physically imposing at five foot five and 138 pounds, Hefford was skilled, fast and slippery. She scored big goals for Canada, including the game-winner for gold at the 2002 Winter Olympics in Salt Lake City. "You're proud of the victories and the Olympic medals, but on a personal note, I'm proud of the longevity I had and the consistency within that longevity," Hefford told The Canadian Press. Canada beat the Americans 4-3 in overtime for gold in Hefford's national-team debut at the 1997 world women's championship in Kitchener, Ont. "I remember that world championship so vividly being my first and the feeling I had when we won that game in overtime," she said. Wickenheiser and Hefford are the only two Canadian women to have played in all five Olympic women's hockey tournaments starting in 1998. With the gold in Sochi, Hefford, Wickenheiser and teammate Caroline Ouellette joined Soviet biathlete Alexander Tikhonov and German speedskater Claudia Pechstein as the only athletes to win gold in four consecutive Winter Games. The national women's team has a camp in Calgary next week. Wickenheiser, 37, continues to play. Hefford gave birth to a son, Lachlan, on April 13. She and partner Kathleen Kauth, a former U.S. team forward, also have a two-year-old daughter named Isla. The oldest player on the Canadian team in Sochi, Hefford's legacy is of a player who never rested on her success. "It's a true testament to her as a player, as a leader, as a person, to just be able to stay at the top of her game for that long," Apps said. "Jayna never lost a step. She was just continually getting better." Hefford reinvented herself as a hockey player in 2008, even though she was an indispensable player on a winning team. "I remember it being a drastic decision in 2008 when I started working with a skills coach," she recalled. "At the time, I had a pretty secure spot on the team. It would have been easy to keep doing what I was doing. "But I remember feeling if I wanted to stay in the game, I had to get better, work hard and do things differently. Working with a skills coach to shoot the puck better and gain new skills that were maybe stagnant for a little while, I attribute that to the success I had later in my career." Apps was a utility forward filling multiple roles during her 13 years playing for Canada. Most recently, the granddaughter of Hockey Hall of Famer Syl Apps used her six-foot, 170-pound frame to create havoc in front of opposing nets. She posted a career 50 goals and 50 assists for an even 100 points in 164 games. Apps ranks second all-time on the Canadian team in penalty minutes behind Wickenheiser with 255. "I was lucky enough to come in as a young kid and stay for quite awhile," Apps said. "As the years went on in different Olympics, I had many different roles. I just adapted to whatever I was asked to do. "That was something I prided myself on in terms of if they needed me to go out and be on the first line or if they needed me to be on the fourth line." Apps completed the Muskoka Ironman triathlon Aug. 30 in just under 15 hours. Both she and Hefford will take some time to decide what their next steps will be professionally, but Ward's main reason for retiring was her off-ice career. At 28, Ward has more years of elite international hockey in her, but she landed a dream job last year as an assistant product manager for sticks with the equipment company CCM. "Pretty lucky to be able to combine business and hockey together," Ward said. "My academics and my career have been among my priorities and obviously sport was, hockey was. "I was able to achieve my dreams in hockey, but I have other dreams with my career. It's hard to let go at my age, but at the same time I need to prepare for what's next." Ward's arrival on the national team in 2008 was part of a push to bring in quick, puck-moving defencemen who could inject creativity and speed into the offence. She quickly became one of Canada's top defenders and a team leader as she was an assistant captain in Sochi. Ward had seven goals and 36 assists in 77 games wearing red and white. Hefford's former teammates start pursuing the next international gold medal next week. Hefford will be busy with her baby and toddler, but she's also plotting a return to hockey as a coach or manager, or on the business side of the sport. "With two young kids and family, priorities sort of change a little bit," Hefford said. "I have lots of things to look forward to. I know I'll still stay involved in the game."